Price growth is continuing at a steady pace throughout the UK's property markets despite weakening wage growth and increased affordability issues for domestic buyers. All indications are that the majority of residential property sales are to investors both at home and overseas. Rental yield growth, despite slowly stagnating in London is being consistently outstripped by regional cities now attracting increased investment with better performing buy-to-let markets. Q1 2015 saw a national increase in rents of 10% although in the mix, London rents remained relatively flat for the first quarter, many believing in prelude to a possible collapse in its private rental market. Combine that dynamic with much lower base property prices outside London and it's no surprise investors are seizing opportunities where the margins are in BTL purchases. Investment is driving the Boom but will it bust London's Market too? Analysts have been predicting a price correction in London's property markets for the last few quarters and now many believe the consistently rising levels of investor activity will be the catalyst. The Bank of England's minutes of the Monetary Policy Committee meeting in early May and published this week, confirms concerns of 'upside risks to house prices in the second half of 2015” due to there being more buyers than sellers in the UK's housing market, nowhere more so than the capital. 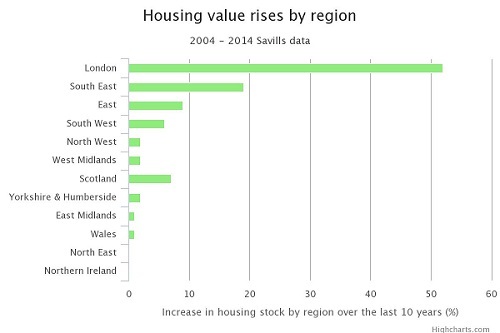 Wage disparity and housing affordability remain huge issues throughout the UK and yet house prices continue to rise. The MPC report that the 'average of the lenders' house price indices had increased by 1.3% in April, a bigger rise than expected'. It goes on to say: 'Provisional data from the RICS survey for April had indicated that secondary housing market supply had continued to fall relative to housing demand. The net balance for new buyers' enquiries had risen and that for new instructions to sell had fallen'. The economic fundamentals in the UK seem to present one picture when the reality is somewhat different. This is mostly reflected in employment statistics. The MPC says: 'Employment growth since the end of 2013 had been disproportionately concentrated among employees in occupations that tended to attract lower average pay rates and on average with fewer qualifications'. This week, the pound tumbled against the dollar as the UK entered deflation territory for the first time since 1960. April's inflation data dropped to -0.1% and food prices slid 3%. The traditional correlation between high unemployment and low inflation has been turned on its head. Unemployment in the UK fell 5.5% in Q1 2015, following consistent declines through 2014 and meanwhile, inflation has fallen from a high of 1.9% in 2014 into negative territory this year. The climate in the UK's property market is such that buyers of principal residences are being outnumbered by investors. When changes to UK pension regulations came into force in April this year, a further 200,000+ potential investors gained entry to the market, something that is reflected in continuing house price increases. Many analysts believe the high level investment taking place in the London's core property market has inflated prices disproportionately to value and will inevitably lead to the bubble bursting. Housing bubbles traditionally begin with increased demand in the face of limited supply that takes a relatively long period of time to replenish and increase. Speculators enter the market, believing that profits can be made through short-term buying and selling which further drives demand. At some point however, demand inevitably decreases either due to stagnating supply or as is most likely in London, because margins become so narrow as to no longer represent value to investors. A Price Correction in London's Property Market is No Bad Thing! With wage disparity in the UK at the widest it's been for decades and housing affordability a serious concern to many, a rapid downward adjustment to London's property prices would present some extremely welcome relief. After all, the principals and criteria behind buying a principal residence rely less on capital appreciation and more on the initial outlay whereas investors seek both income and intrinsic value growth. Over the last 18 months, property prices in London have mostly been buoyed by investment at the top end but now that has filtered down to just about any property vaguely described as 'residential' throughout the capital. By 2015 average London prices stood at more than a staggering £500,000. London's rapidly expanding buy to let market has been the main driver of price growth outside prime residential markets but relative rental growth is also a key deterrent to affordability for the capital's many thousands of private tenants . International estate agents Savills published a rather gloomy forecast for owner-occupiers if London's property bubble doesn't burst, saying that: “Between 2014 and 2019 across England and Wales the number of households privately renting will increase by 1.2 million, owner-occupiers will fall by 200,000 and social renters decline by 50,000”. Despite continuing price growth in London's core real estate markets, there is a growing trend among both domestic and foreign investors to look towards the North of England for better margin opportunities. As yields in London become narrower in the coming months, more investment will be pushed outside its boundary, penetrating regional centres like Manchester and Halifax with more growth potential. Although it will be interesting to see just how high prices climb in the capital, it will be an enormous relief to those living and working in London when the bubble pops. London's residents will also have their faith restored that its housing market doesn't discriminate against them through affordability in favour of lining the pockets of wealthy investors.